The Dow, Nasdaq and Russell ended the week with a gain but they were only fractional. The Dow gained only 31 points for the week. The Nasdaq gained 7 and the Russell only managed a 0.35-point gain. Fortunately, that kept the streaks alive for five weeks of gains. Unfortunately, the longer the streak the more likely it is about to be broken. There is a pattern known as a rolling correction. While that refers to larger market events it also applies to smaller consolidations. The market rallies sharply for several weeks and then instead of declining for a week or so it simply moves sideways as some investors take profits while others establish new positions. We had a minor version of that last week. 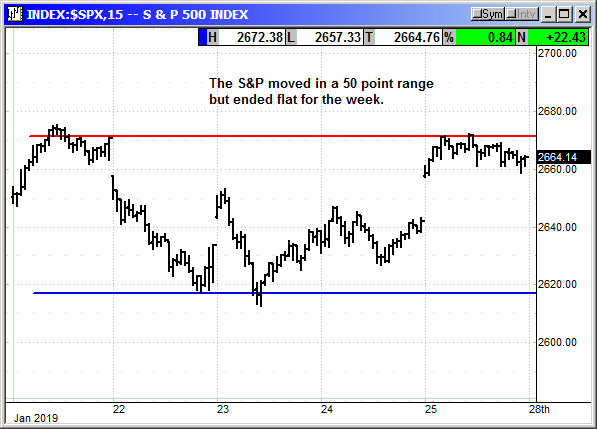 The S&P traded in a 50-point range but ended flat for the week with only a 6-point loss. The three days of sideways movement and increased volatility gave investors a chance to shuffle positions ahead of the earnings next week. Everyone should now be positioned and waiting for the fireworks to start. 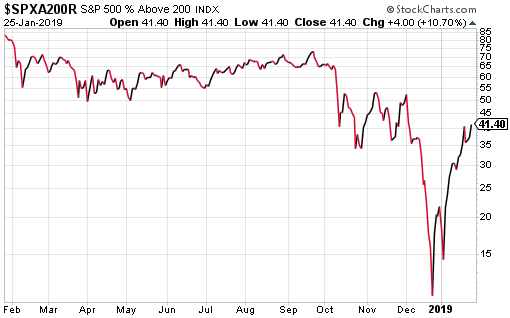 Every week I show the A/D chart for the S&P because it tells us what is going on under the daily gains and losses. Advancers continue to overwhelm decliners except for last Monday. 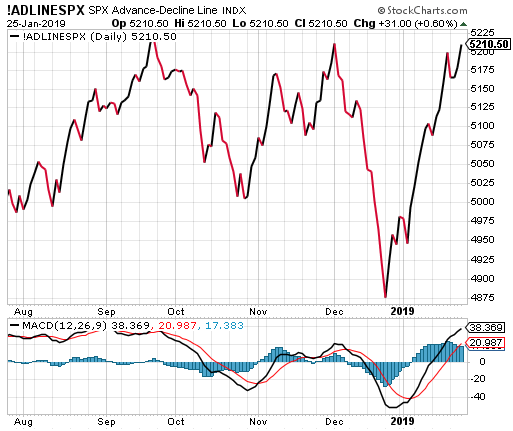 Even though the S&P had a choppy week and remains 9% below its 52-week high, the A/D line is about to breakout to a new high. This is bullish because it means investors are buying the broader market even if a few big caps are struggling. 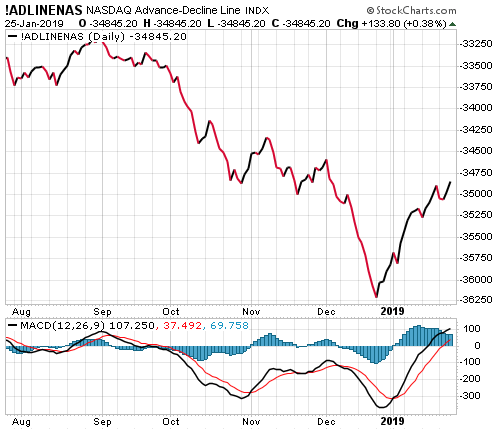 Note the difference in the Nasdaq A/D chart. There is a lot more indecision under the surface for the tech sector. On the Nasdaq the generals are leading but the troops are unorganized and have not decided if they want to follow. This is the chip sector and banking sector providing the drag. Chips have been weak because of the Apple warning and component manufacturers also warning. Until Apple reports earnings on Tuesday, we will not have a concerted move in any direction on chips. We did see a surge in chips on Friday after Intel reported. Intel fell sharply but chip stocks surged on Intel's guidance. This is bullish for the Nasdaq if it continues but Apple's earnings is the roadblock ahead. If Apple says they over compensated on their earnings warning and things are not as dire as they expected, then we are off to the races. If they say iPhone sales have not picked up and they give weak guidance for Q1, it is going to be an ugly week for tech stocks. 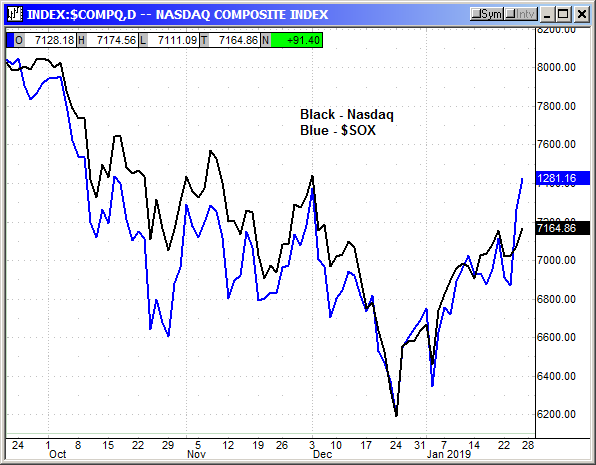 Note that the A/D for the small cap stocks is actually more bullish than the Nasdaq. This is a positive sign and we could see it continue if the chatter is positive ahead of the Chinese trade meeting this week. 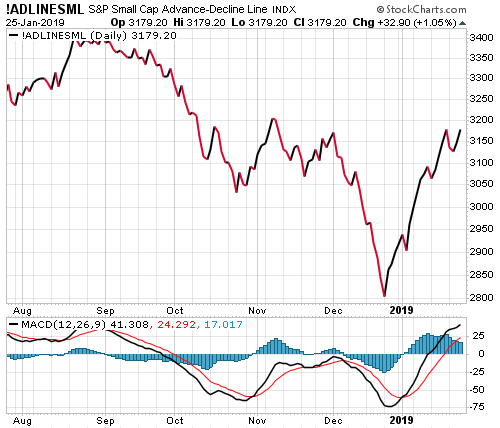 While tariffs on Chinese goods would not normally be a large impact on small cap stocks it is a sentiment challenge for the economy and therefore on the main street economy where these stocks operate. 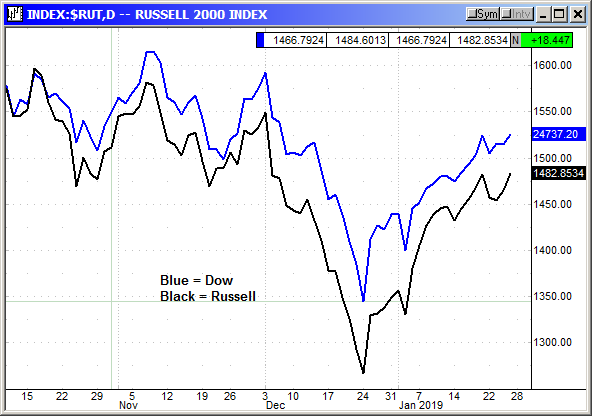 The correlation between the Dow and the Russell is returning to normal and that will be bullish for market sentiment. With the Russell closing at a 5-week high it is actually starting to lead again. 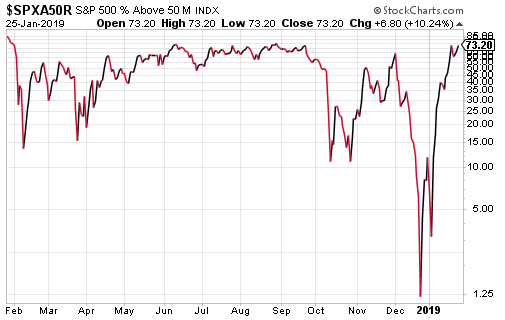 One of the most bullish charts of the week is the percentage of S&P stocks over their 50-day average. This fell to 1.25% at Christmas and it has rebounded to 73.2% and right at the highs from back in Aug/Sep. This is clear evidence of a bullish undercurrent in the market. Of course, the sharp dip in December dragged the 50-day averages lower so the rebound in prices had a lower target. The slower reacting 200-day had a lot less crossovers. In late December only 10.8% of S&P stocks were over their 200 day and that has improved to 41.4% but still has a long way to go since normal is about 60%. The broad market is still in rally mode. The Russell 3000moved over 1,538 and then used 1,550 as support. The next major hurdle is in the 1,650 range. 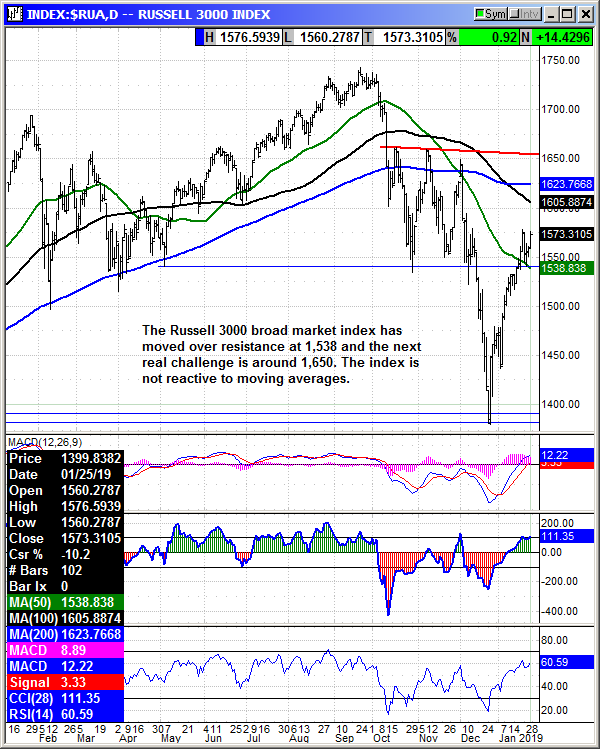 The R3K is not reactive to moving averages because it has so many components. The index did honor the 200-day back in early 2018 but that was a rare instance. I remain bullish on the market and would buy a dip this week. However, with the outlook for Q1 earnings moving lower every week, we could be only a couple weeks away from an earnings recession challenge. If the Q1 forecast turns negative, the market will decline. However, if the Chinese trade meeting ends on a positive note the market should rally. That could delay any earnings drag but in the end, the earnings are the key to any market gain.